The Nailsea Christ Church Baptism transcripts covering the period 1813-1918 are now available for Society members to view online. The following baptism transcripts are now available for society members to view online. As I write this I am watching the antics of three young seagulls on a neighbouring roof trying out their wings. They are flapping away furiously and occasionally have a tiny successful lift off but immediately they are back where they started. It’s a bit like family history research! I’ve been flapping away trying to break down some brick walls and so it was great at our last meeting to hear from members who had successfully unravelled their families. Thank you to Peter, Ann, Arlene, Anne, Pamela and Sue who shared the results of their research. It was interesting to hear how they had managed to solve their problems and it gave ideas of other routes to take. August is always a quieter time for family history; we do not have a meeting but we will be at Weston Library each Saturday afternoon as usual. The web site has been very quiet as well – very few research queries – does this mean that you have no brick walls?! Familysearch as a free site is very useful and does contain images of some of their resources. This article has just been published which explains how to find these hidden records which are not always obvious. Although the example given was for an American record the same method can be used to locate British records. Boy George and his Irish Ancestry can be discovered by clicking on Boy George. The Genealogist also has items about people from previous series – they claim that the most popular one is about Danny Dyer! Keep up to date with what is happening in Federation of Family History Societies by looking at their home page. If you scroll down you will find a link to their Really Useful Leaflet which - if you have never seen it- is really useful! It was sad that the Family History Magazine which you could read online by using your North Somerset library card ceased to be published in March but there are so many other magazines available including the BBC History Magazine which you may like. You find them by going to the North Somerset Library Onlinelibrary and scrolling down until you get to eMagazines. All free of charge. The young seagulls have just taken off but have landed on the wrong roof and are now puzzled about how they got there. I said it was like researching family history! Happy Holidays – See you in September. The WsM Milton Road Cemetery burial records (books 29-40) covering the period 1924-1942 are now available for Society members to view online. Forget Football and find your ancestors! For four full days from 6-9 July, you can explore all the UK and Irish records, including the newly added 1939 Register, for free. Go here for more details. Good Luck! Thanks to Sue Maguire for the June edition of Buckets and Spades – which included information about a Local History Exhibition which is held at St Augustine’s Church, Locking showing interesting facts about Locking Village and the former RAF Locking. If you go on any Thursday afternoon you can also get some refreshments. This made me think about other places you could visit during the summer months. While on the Pier you might find the Museum of Memories interesting. It’s situated on the 1st Floor of the Grand Pier neat the Go Karts and may bring back memories of your childhood. Associated with the Heritage Action Zone Project, North Somerset Council has produce a “Gems of Weston Walk” which takes you around the centre of Weston-super-Mare. Full details of the Walk with a map and descriptions of the building you pass on route can be seen here. Weston Museum is hosting a free “Know Your Place” mapping day on Saturday July 21st from 11.00am – 3.00pm. “Know your Place” is a really useful free resource for family historians and although originally covering Bristol it now includes the surrounding counties including Devon and enables you to see and use maps such as tithe maps, enclosure maps, OS maps, etc. so that you can see how the area in which you are interested in has developed over the years. Weston Library has been holding a sale of Local History Books and over the past few weeks I have purchased (very cheaply) several old books which were surplus to requirements in the Library. You may find something of interest there – if the volunteers on a Saturday haven’t already pounced! 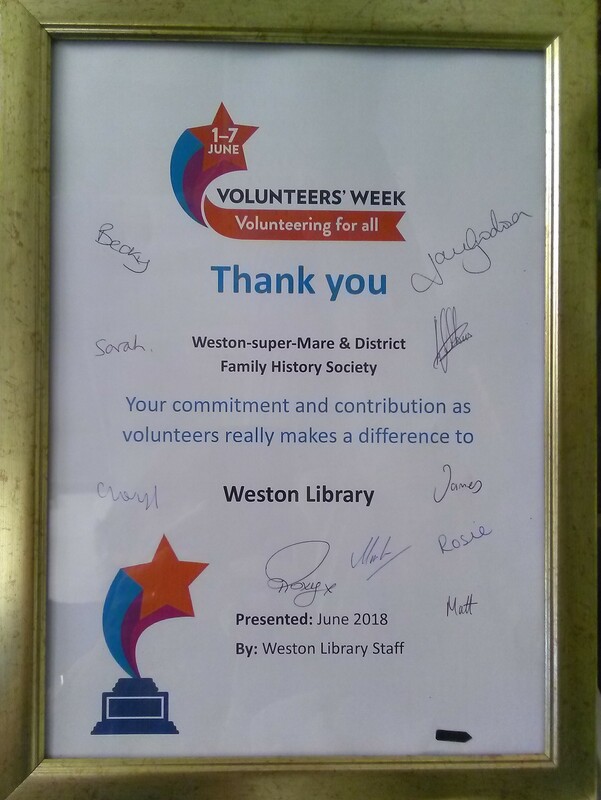 Talking of Volunteers – we were touched by and grateful for a certificate which was presented to the Volunteers at Libraries in North Somerset recently. The only Help Sessions which we are now offering are those on a Saturday afternoon at Weston Library from 2.00 - 3.30pm. We enjoy the challenge of assisting anyone who comes in and it’s great when we solve a problem which has been puzzling someone for a while and also share with them a sense of achievement. The other way of breaking down brick walls or getting a second opinion about your research is to use the Research Forum on our Web Site. It has been rather quiet recently so now is a good time to ask that question which has been troubling you and if can offer advice please do so. I’m still waiting for someone to comment on my STOKES query! Has anyone else found an entry in a parish register where it looks as if the wrong name is used? From July 9th the 2018 series of “Who do Think You Are?” will continue in earnest with Olivia Coleman. These programmes, designed as entertainment, although giving a glimpse into the methodology of family history research do raise expectations of a quick and easy result. However I do enjoy them and can gain some inspiration even if I will not be travelling around the world to visit the haunts of my ancestors. Last December the Who Do you Think You Are? Magazine published an article “How well do you know family history resources?” If you go to this page and click in the text on the word “here” you can have try at a simple(?) test to see how well you know your resources. If you have found any resources which have been particularly helpful please add them as a comment to this Update. We do not have a meeting in August but on Sept 25th we welcome our vice-chairman, Peter de Dulin with a talk entitled - Whatever Happened To Henry Charles Jewell And Other Mysteries? – sounds intriguing. Shortly afterwards, on Oct 1st we will have our Autumn Lunch – menu in Buckets and Spades. If you would like to join us please contact Peter de Dulin by using the contact us button at the top of the page. Wishing you all a Happy Summer Holiday – I’m off to a granddaughter’s wedding so that’s a whole new family to add to my tree!